The prefecture of Rethymno is most suitable for a summer break and has many very beautiful and clean beaches. Fine sandy beaches can visit both the north coast, the Cretan Sea and the south, in the Libyan Sea. 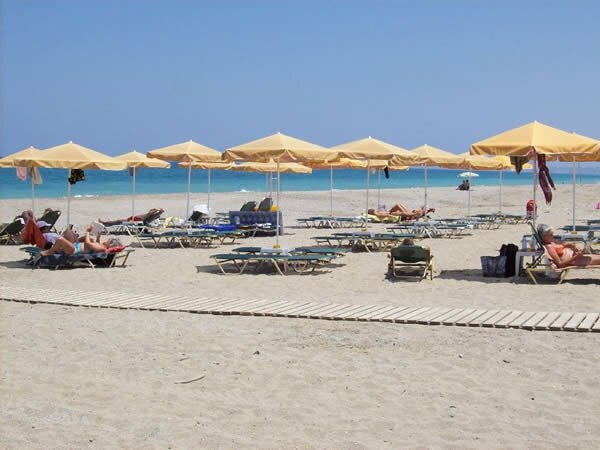 Rethymno Beach: sandy beach longer than 20 kilometers stretching from the town of Rethymno and east regions Perivolia, Platanes, Adelianos Campos, Scaletta. Episkopi Beach: Long sandy beach west of Rethymnon, organized by installments. Panormos: On the beach of the seaside village of Panormos, just 20mm. east of the town of Rethymno, one can enjoy a swim in the beach near where there are several restaurants, hotels and apartments. Bali: Bali bay, where the homonymous coastal settlement, located 34 km east of Rethymno has the potential visitors to choose one of the small coves and swim while enjoying the convenience of an organized beach. The area has many restaurants, hotels and apartments. Plakias: The village of Plaka, located 40 km south of Rethymnon, is a resort with a wonderful sandy beach and extensive facilities in hotels rooms, taverns and restaurants. At the beach you can swim in addition to do a variety of water sports. Korakas: This beach is also situated on the south coast, more precisely south of the village of Rodakino, 42km from Rethymno. The sandy beach of Korakas is organized and the area offers hotels, as well as a large variety of rooms and taverns. Plakias village: The fisher village of Plakias is situated 40 km south of Rethymno. A place with well-organized infrastructures includes hotels, rooms, taverns and restaurants. The organized beach offers both bathing and various water sports. Souda Plakias: Organized, sandy beach west of the village of Plakias. A few tavernas are situated close to the beach, where rooms are also available. 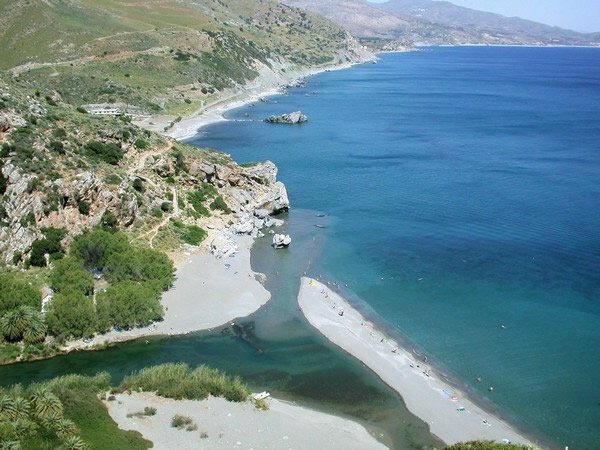 Damnoni: Organized sandy beach west of the village of Plakias and south of the town of Rethymno. It offers a few taverns and rooms are also available. Ammoudi: Small sandy beach near Damnoni not organized and almost isolated. Preveli Palm Beach: is 38km south of Rethymno, little before the historic Monastery of Preveli, a track on the left hand side leads downhill to a parking place. Down the hill for 15-min. To arrive at the beautiful sandy beach with palm trees, where the River Kourtaliotis empties into the sea. Triopetra: The Trio-petra beach got the name from three distinctive rocks in the sea, is situated approx. 50 km south of Rethymno. Follow the road to Aghia Galini and turn left after 40 km in the direction of Akoumia village. Continue until you arrive at the triopetra sandy beach. 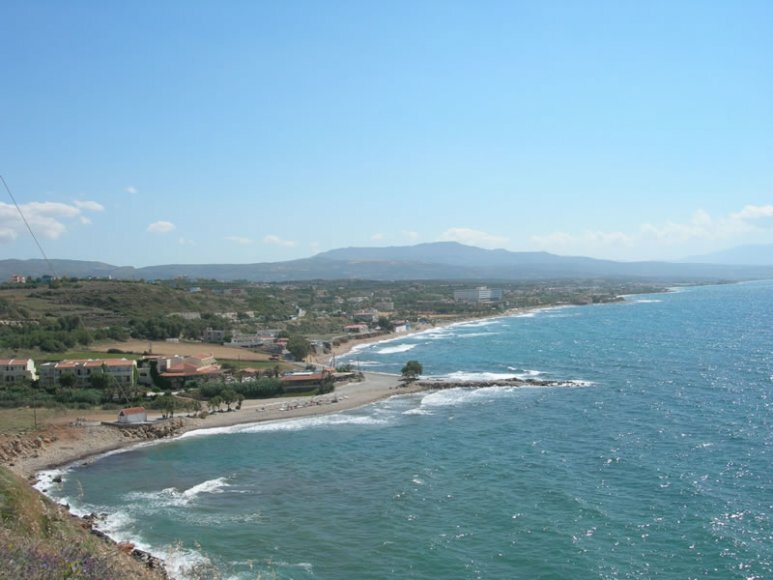 Aghios Pavlos: The wonderful sandy beach of Aghios Pavlos is found 60km south of Rethymnon. Follow the road to Aghia Galini and after 45km turn right at the crossroads of the village of Kria Vrissi. Continue until you arrive at the seaside. Have a bath in one of the isolated bays, which have formed between the rocks, and seeing the sand dunes will be a memorable experience. In the village of the same name you will find rooms and tavernas. Aghia Galini: This resort village is about 60 km south of Rethymnon. Apart from a plentiful area the village is also known for the beautiful and clean beaches, which are situated in various picturesque bays in the area.